Garner up pleasant thoughts in your mind, for pleasant thoughts make pleasant lives. He died in London most likely from the medicines used to treat his kidney stones and stoppage of urine. 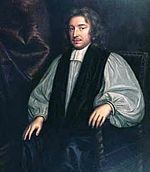 Wilkins is one of the few persons to have headed a college at both the University of Oxford and the University of Cambridge. His personal qualities were brought out and obvious to his contemporaries in reducing political tension in Interregnum Oxford in founding the Royal Society on non-partisan lines and in efforts to reach out to religious nonconformists.